Shimada has new distribution in the USA, Oban. Oban has a little over 100 fitters in the US, all of which have been visited and evaluated by Oban management. My understanding is that the Shimada shafts will be available exclusively through the network of Oban fitters. Earlier this year I reviewed the Shimada 115g CT iron shaft. It will soon be joined by a lighter weight fitting set. The Tour 301 and Tour Lite are more conventional constant weight tapers. As you have seen in the charts, Shimada manufacturing quality is second to none. It is good to finally have reliable distribution in the US. Shaft to shaft consistency in the four sets I measured is perfect. If you are looking for light weight iron shafts, set consistency sets steel apart from carbon fiber. You can be confident that sets made from either the mid 90 gram Shimada 3001 and the 106 gram Shimada Tour Lite will be consistent through the set. This entry was posted in Iron Shafts - Steel, Oban, Russ Ryden - Fit2Score, Shimada on June 8, 2017 by Russ. Oban in a partnership with Shimada, has introduced a set of iron shafts through their dealers called the CT-115. A taper tip shaft with a constant weight of 115 grams, it comes in 12 discreet lengths which in turn can be fit and assembled to bring you 7 different flexes. As follows; R, R+, S-, S, S+, X- and X. The lengths are 36” thru 41.5” in half inch increments. The aesthetics of this shaft provide a nice, brushed chrome finish and an eye-catching, hologram shaft label that you can apply over the steps on the shaft without any form of wrinkling. Now that is a club builders dream! The club builder selects a group of shafts to build a set. Using the shorter shafts, the set is stiffer. With a group selected from the longer end of the matrix, the set will be stiffer. 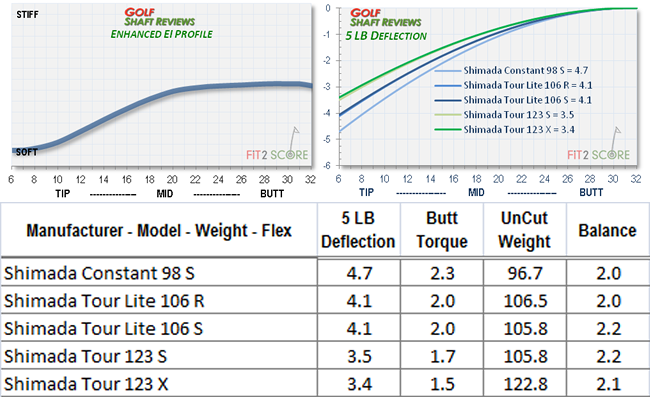 All of the shafts are .355 tips and all were remarkably consistent in weight as you can see in the chart below. The word remarkable meant 115.3 grams plus – minus .3 grams. To put that in perspective, a typical set of constant weight irons usually has a bit less than a 2 gram range. Adding to that attention to quality, the radial consistency was 99.9% with a 0.1% standard deviation. That’s impressive, aligning these is truly useless. We have built a number of fitting irons with these shafts (PXG and Miura) all through the flex range and the numbers are quite impressive. Taking it from the Fitting Studio and on through the consequential building process we liked what we saw especially with the better player, who launched these lower in the shorter irons, higher in the longer ones and all with the characteristics of a low to mid-spin shaft. 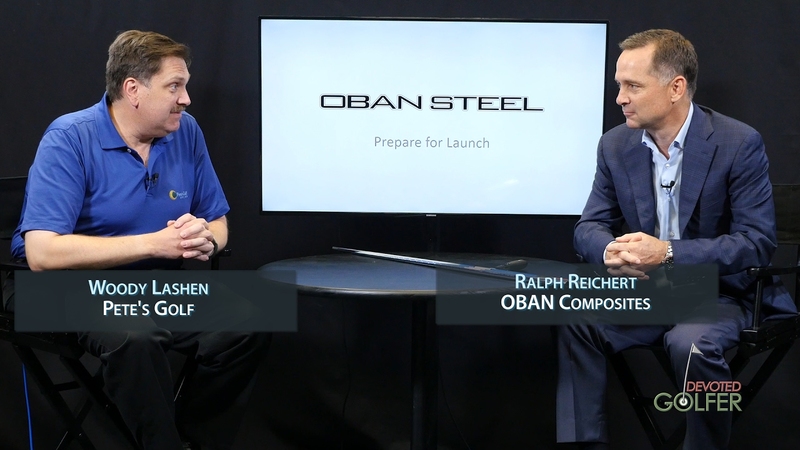 Lets here from Ralph Riechert, the President of Oban, discussing the shafts with Woody Lashen of Pete’s Golf at the 2017 PGA Merchandise show. This set of iron shafts is designed for a golf fitter that wants to deliver precisely tuned stiffness to their clients. In the past, that was done by tip trimming parallel shafts. The Oban CT-115 has all the advantages of parallel shaft designs with none of the disadvantaged. Advantage one, the set will be constant weight not descending. Advantage two, the stiffness steps between clubs is precisely done by the factory and not left to the club makers frequency instrument. Advantage three, the set stiffness range is on the high side unlike parallel sets which tend to be on the low end. Below are the Launch Monitor results of a 2 Handicap… A big, strong, strapping guy who can hit the ball as good as any I’ve had. He loved the feel of the shaft and did not have any reservations with the 115-gram weight. We brought him through the fitting process with all of the premium shafts that we offer. In the end, the OBAN won out with feel, stability, ball flight and ball dispersion. This entry was posted in Frank Viola - Ace of Clubs, Iron Shafts - Steel, Oban, Russ Ryden - Fit2Score, Shimada on February 20, 2017 by Russ. In response to a request from a viewer, the Shimada iron shaft data available on my old shaft review page has been resurrected. it has been some time since I measured these and some of the data now shown in the current reviews is not available. The review samples are no where to be found in the shop. The profiles look much like the new TourTemper XP 95 S flex design, That same design is available in different weights and stiffness. This entry was posted in Boutique Brands, Russ Ryden - Fit2Score, Shimada on February 4, 2014 by Russ.